British Invasion! 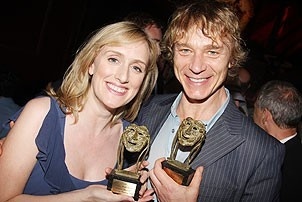 Pond-hopping winners Jenna Russell and Ben Daniels show off their new awards. New York's newest stars were honored on June 10, when they gathered to mix and mingle with seasoned stage veterans at the Helen Hayes Theatre for the 64th Annual Theatre World Awards. The awards, which celebrate fresh faces making their on and off-Broadway stage debuts, were bestowed upon some of the season's best breakout stars, including Passing Strange's de'Adre Aziza and Daniel Breaker, Les Liaisons Dangereuses Ben Daniels, South Pacific's Paulo Szot and Loretta Ables Sayre, Sunday in the Park with George's Jenna Russell and Cry-Baby's Alli Mauzey. As the recipients mingled with previous award winners (who presented the awards) like Alec Baldwin, Laura Linney, B.D. Wong and Rosie Perez, one thing was clear: this won't be the last you'll hear of these talented newcomers. Click here to meet all the winners!